Volatility is a well-known measure for predicting risk to product delivery caused by too many unplanned changes, especially later in the product cycle. 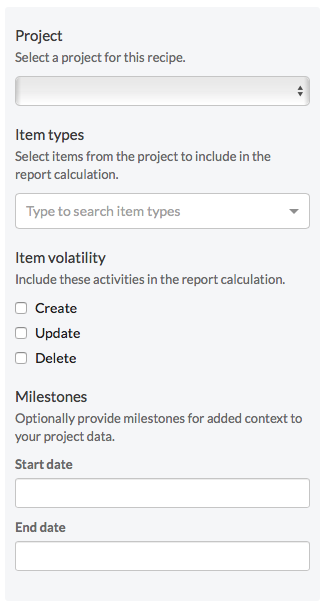 Once you import data from Jama Connect, you can use templates in Jama Analyze to customize reports to measure your project volatility. From the Jama Connect index page, select the volatility trend panel. You will be taken to the the workspace where you will be able to set filters for you report. This dropdown will show all of the projects that you have imported into Jama Analyze during the setup process. If you don't see the project you want, you'll need to reconfigure your import and let the import run. Since each project in Jama Connect can be completely unique, you'll want to select which of the item types you are interested in displaying volatility for. Select the activities to be used in the volatility calculation. You can set a start and an end date to your trend. Any item counts and activity that falls outside of the selected date range will not be shown on the chart or included in the volatility calculation. Once you have defined your filters, you can now hit the preview button, and the chart on the left of the filter panel will load. At this point, you can save the chart, or update the filters to preview another one. You can also start from a previously saved chart, edit the filters, and save as a new chart. To load your saved charts, use the dropdown above the top left corner of your chart. 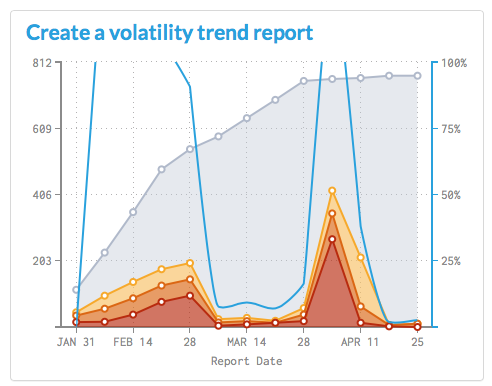 Volatility trends can be added to your existing dashboards and they can individually be made public, which you can then share with a public URL and access code. Above your chart, you will see a Settings and a Share button. Visit the settings to add your chart to any of your existing dashboards. From here you can also add a description, edit the chart name, and manage the public access settings.